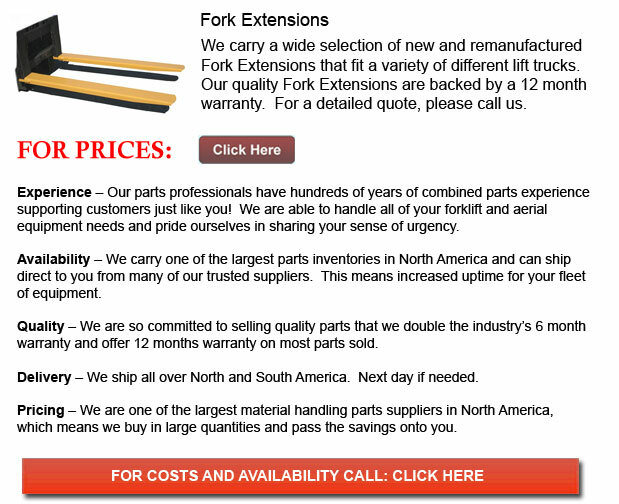 Fork Extension for Forklifts - Lift Truck extensions are a excellent option when there is a need to reach further than your existing forks would allow. In some situations whenever you have a load that exceeds more than can be safely lifted on your forklift, an extension can help you execute your task safely. Extensions will offer added capacity and support to the forklift when moving or lifting pallets, containers, or extremely heavy cargo. What's more, the extensions will add more length to the existing blades enabling the one operating it to reach farther than before. Utilizing forklift extensions truly saves a company the need to buy individual machinery to be able to do the job. This could save potentially thousands of dollars while adding more efficiency and productivity choices utilizing the machine you already have. Several of the fork extensions will simply slip overtop of the forklift blades. Extensions can be acquired so as to fit forks with widths from four to six inches. It is extremely essential that you measure the extensions to be certain of a correct fit. Knowing that extensions have an inside width which is half an inch wider as opposed to the size stated is vital to ensuring the right fit. When buying your extension size, make certain it is equivalent to your blade's width. For instance, if you have blades which are 6 inches wide, you will utilize an extension which is six inches wide. There is safety standards established by OSHA that regulate the length of extension that you could use. According to the guidelines, extensions are not able to be longer than 50 percent of the original fork length. Following these rules would help to sustain a safe operation. A yellow powder coat finish is added to the metal forklift extensions to be able to avoid corrosion. The two most common measurements for forklift extensions in the trade are 60" and 72", although, various lengths are available. There are two individual securing systems available. The first option secures the extensions onto the lift truck with a single pull pin. The second and safer choice is the safety loop which is welded on and provides a more stable attachment of the extension. The lift truck extensions are presented either tapered or non-tapered for nearly all container and pallet loads. Triangular extensions are utilized when transferring cylinder loads. Loads which have coils, pipes or drums are considered to be cylinder loads. Extensions for cylinder loads are also made of steel. They are built to fit forks up to 2" thick and that are 4" to 5" in width. Secured in place utilizing a locking bar, they slide off and on without difficulty. Triangular extensions vary in length from fifty four to sixty inches. It is always a good plan to use safety measures whenever dealing with whichever type of industrial equipment and lift truck extensions are no different. Checking your lift truck extensions before using it is likewise a great routine to get into. Once the extensions have been placed onto the forklift, the attaching mechanism should be double checked also. Personal injury or destruction to the load can occur if the extensions were to become unfastened and fall off. Adhering OSHA regulations will also help in order to guarantee the safety of the one operating it and individuals working nearby.